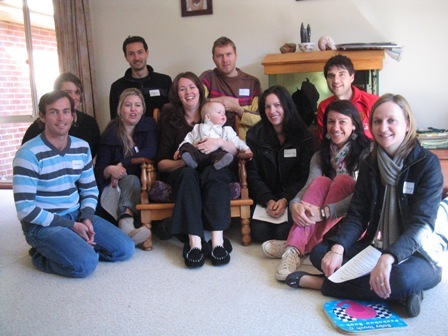 Teaching in Australia’s National Capital Canberra has been a regular adventure for many years. This visit marked the 30th birthday of my host Korinne (below, with baby Archer). She had invited guests from as far away as Papua-New Guinea, so it was an eagerly awaited event. A generous sprinkling of men in the class changed the dynamics from my usual all-female extravaganzas. 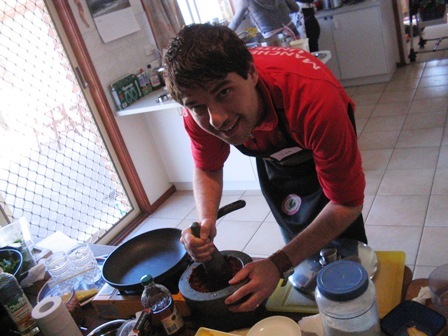 Here Jason pounds the Thai red curry paste. Fennel-scented doughnuts in berry-laced Greek yogurt was the grand finale, rendering us all prostrate for a good few hours. I managed to get to the bus depot in time for my express bus trip back to Sydney.